Oh, boy~! I wish I made more of these wings. 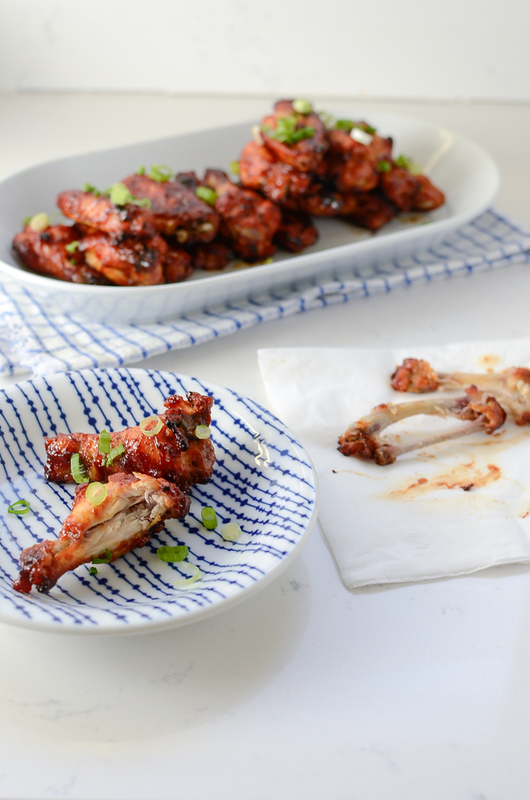 These baked sweet and spicy sticky chicken wings were so yummy that I regretted that I only made a small amount. There were four hungry people in the house when I put them on the table. These wings were gone in less than 5 minutes. What was I thinking? 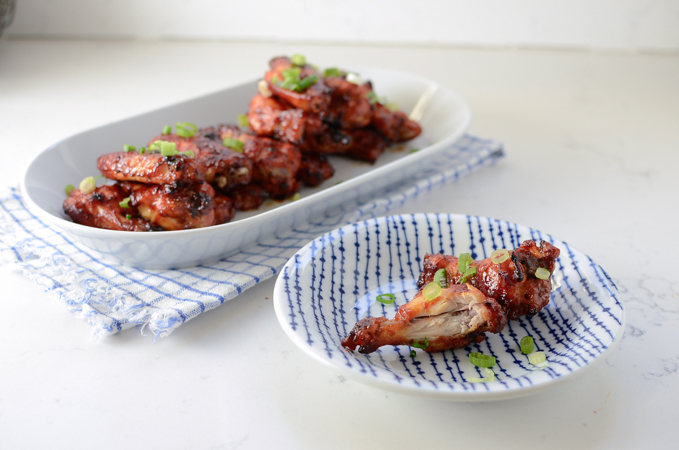 These baked sweet and spicy sticky chicken wings are slightly different than my Korean fired chicken wings. I guess these are healthier since they are baked instead of fired? 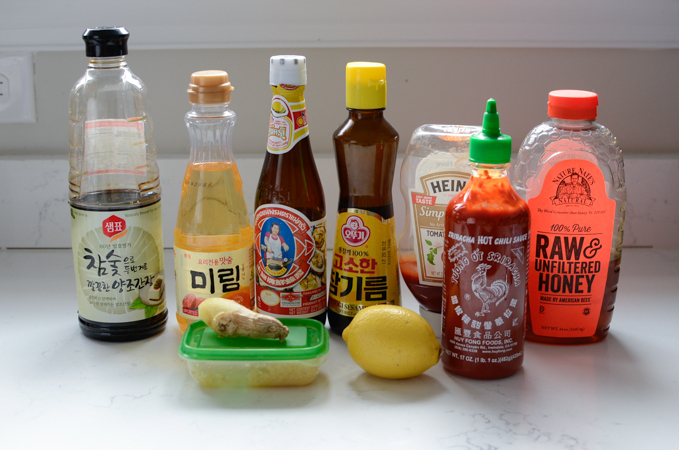 You can whip up the marinade with everyday common condiment that you might already have in you kitchen. These are truly sticky so you will need some wet tissues afterward. The gentle spiciness comes from the sriracha sauce. 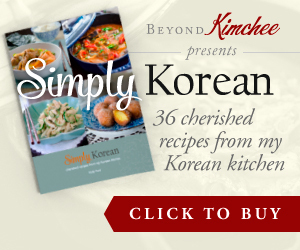 It adds a nice kick to the overall flavor but doesn’t overpower. The sweetness is very subtle. 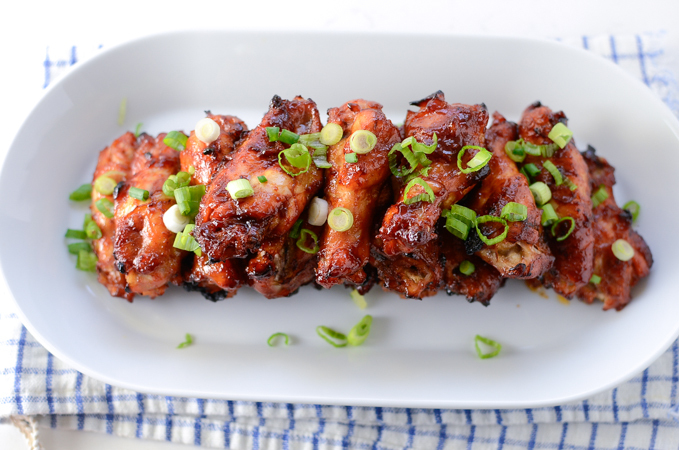 Overall, everyone can enjoy these baked sweet and spicy stick chicken wings in any time and any occasion. You will need this many condiments. Looks like a lot to work with but the prep work goes very fast. 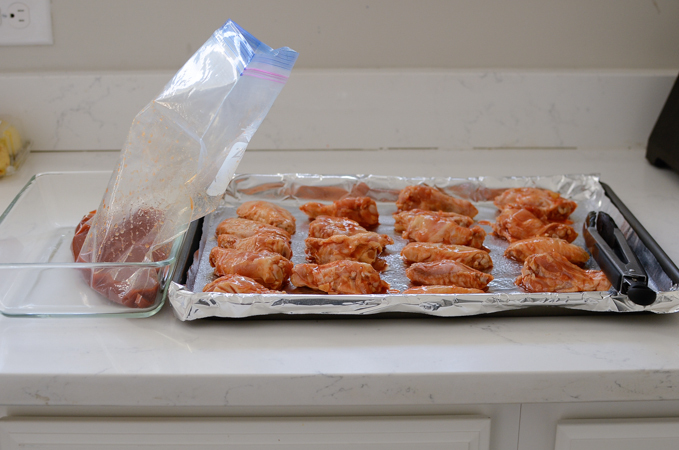 Mix the marinade in a ziplock bag and add the chicken wings. Toss and let them marinade for at least 30 minutes. 2-3 hours, if you have time, will be even better so the flavor will soak into the flesh. Lay them in a single pile. Reserve the marinade because you will need it later. Bake them in a 375˚F oven for 15 minutes. Pour the reserved marinade and toss around. Continue to bake for another 15 minutes. 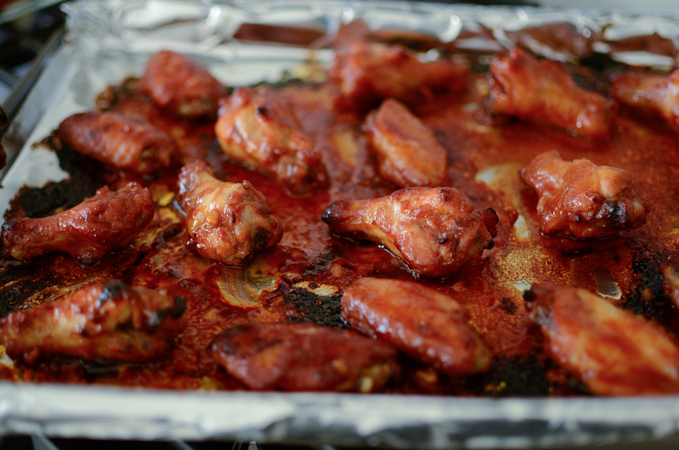 Turn the wings to the other side and bake 10 more minutes or until the marinade becomes a glaze and the wings get sticky. Garnish with chopped green onion if you like. As you can tell, the greens always bring a life to the dish. Looks delicious, right? 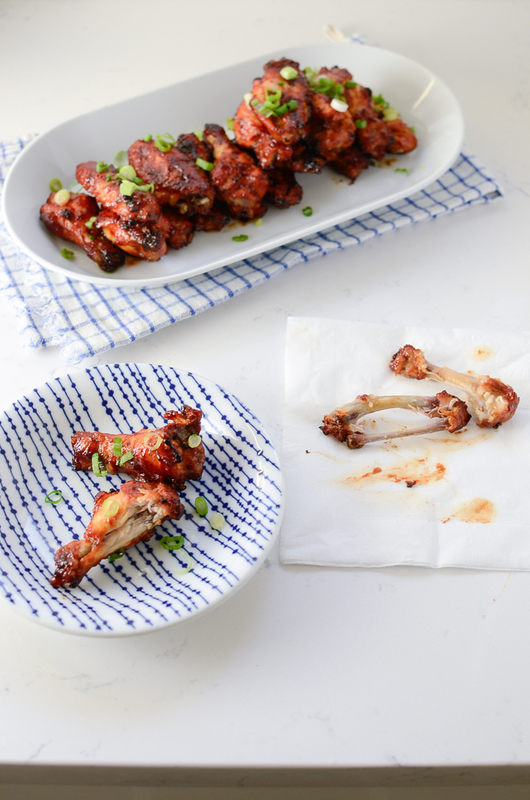 If you bite of one of these baked sweet and spicy sticky wings, you won’t be able to stop. I am telling ya. Grab a cold drink and turn the TV on. Take a plate to the couch, sit down and relax. Then, you are all set to enjoy this yummy creation. Enjoy~! 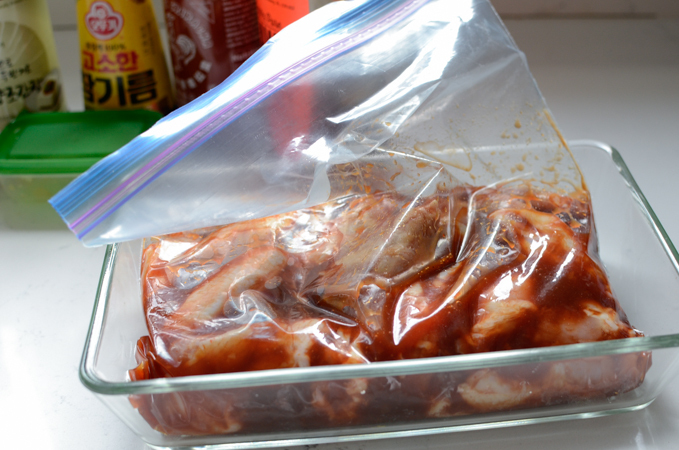 In a large ziplock bag, combine all the marinade ingredients except the chicken wings and the green onion. Mix well. Add the wings and toss well to coat. Set aside for 30 minutes or chill in the fridge for 2-3 hours. 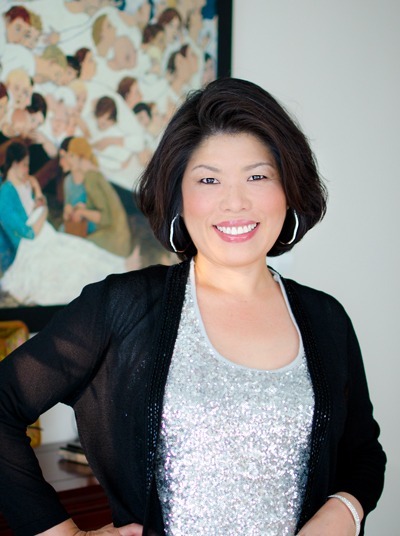 Preheat the oven to 350?F, line a baking sheet with a piece of foil. 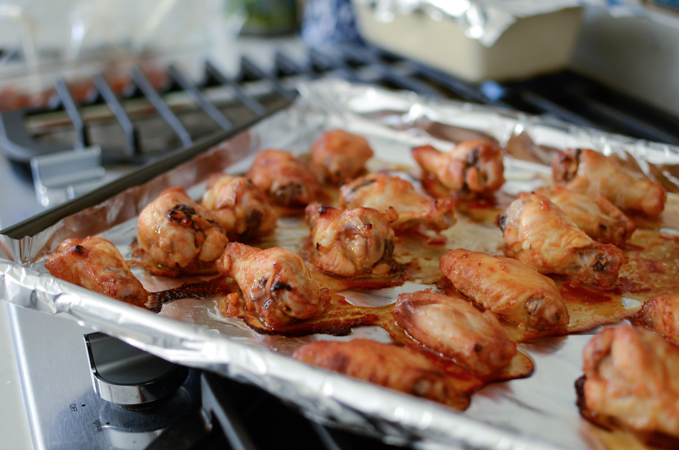 Add the wings to the baking sheet. Reserve the marinade and set aside. Bake for 15 minutes. 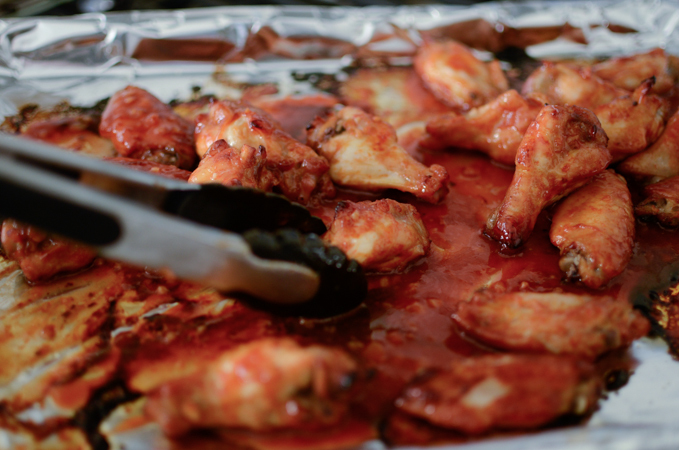 Pour the reserved marinade over the wings and toss to coat. Continue to bake for 15 minutes. Turn the wings to the other side and continue to bake for another 10-15 minutes or the wings get coated with sticky glaze. Transfer to a serving platter and sprinkle with green onion. Good wings are messy, aren't they? These look good. And messy. :-) Really nice -- thanks. That's right. Messy wings are the best! How many pounds of chicken wings? 3 lbs. Thanks for letting me know.